Go on a fun-filled adventure with the unicorns of Melody Village. Read about Gigi the bubbly unicorn and her magical unicorn friends, Gemma, Alika, Stella, Skye and Molly. Find out how they play with the adorable monkeys and sloths of Melody Village. Presented with vibrant images... read full description below. Go on a fun-filled adventure with the unicorns of Melody Village. 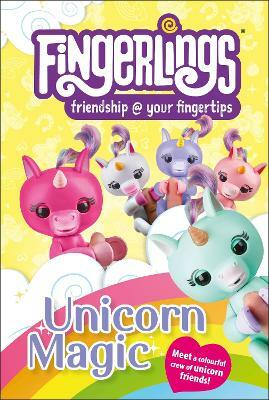 Read about Gigi the bubbly unicorn and her magical unicorn friends, Gemma, Alika, Stella, Skye and Molly. Find out how they play with the adorable monkeys and sloths of Melody Village. Presented with vibrant images, simple vocabulary, and lots of word repetition to engage young readers and help them build their literary skills, Unicorn Magic is a fun read for any young fan of the exciting world of the Fingerlings.